Behavior: Why do the adults visit the nest after the babies are gone? Question: Why do the adult peregrines visit the nest after their babies have flown? Do they miss their babies? Answer: It is normal for adult peregrines to visit their nest occasionally after the young have flown. They don’t visit it because they are “missing their babies” or attempting to re-nest. Instead they do it as a positive act of claiming the site and strengthening their pair bond. One way they claim the site is by digging the scrape (preparing the nest bowl). They lay their chests in the gravel and dig out the stones with their feet as shown at this link. Another way to claim the site and strengthen their pair bond is to court at the nest. Pictured here are Dorothy and E2 bowing at their nest on June 22, 2009. That was a couple of weeks after their young had fledged. 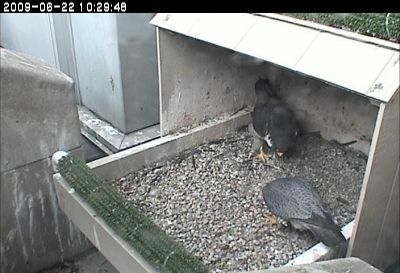 And finally, while juvenile peregrines are still dependent on their parents they pursue them relentlessly for food. Their parents try to find places to avoid them, sometimes hanging out as much as a mile away from home. The one close-to-home place the young will not visit (usually) is the nest. It must be a relief to have a quiet zone to escape to. Thank you for the update and information!